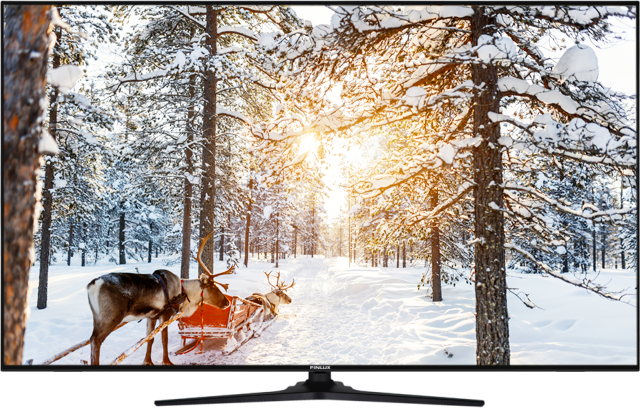 The highest tier TV in Full HD resolution comes with Finlux’s exclusive ultra-slim and fashionable metal design. Every possible feature of FHD TV is combined within a single product. Perfection in design that is inspired by Nordic cultures combining traditional styles with simplistic luxury achieved pure elegance. Latest innovations lead to delivering a mesmerizing TV performance. Tailor-made Finlux smart tools enhance user-friendliness, integrated wireless module helps to build customized environment. Home entertainment boosted with built in surround sound system and availability for online catch-up services as well as the video on demand leaders. Netflix, YouTube, and world’s other mostly used apps are waiting for you. Smart Recommend system identifies your preferences and habits from the broadcasts you watch, and recommends you the shows that might attract your interest. Searching between channels to find out something you might like is handled by smart TV recommendation engine in a manner of time. Finlux smart TV’s are supporting audio – video sharing between your devices to increase home entertainment. It’s now easy to stream music, video and other media around the house without any difficulty. Wireless module integrated models of smart TV’s are now giving you easier access to joy it contains. There is no need to place router near to the TV or use of long distance Ethernet cables.